Just Romantic Suspense: Anything you’d like to reveal? Anything you’d like to reveal? Congratulations to "Mary L.", the winner in Julie's giveaway. Thank you to all who participated! Julie Miller, whose romantic suspense Necessary Action (The Precinct: Bachelors in Blue) comes out April 18th in print; May 1st in digital, joins us in the interrogation room to answer some questions. Going undercover to take down murderous gun smugglers is what Duff Watson lives for. Until he tracks the ring to a Missouri farm…and meets paramedic Melanie Fiske. Now the KCPD detective has another critical task: winning over the curvy redhead who tempts him yet whom he can't let himself trust. Something about the protective ex-soldier makes Melanie believe he can help her find out the truth about her family. And the desire Duff awakens feels like the real thing. But when Melanie's life is threatened, can she keep trusting—and loving—a man who lives a life of dangerous deception? What’s in your tea? Nothing. I drink it straight. And it’s usually green tea. Biggest fear? Getting trapped in a tight space, especially with a lot of people. If you could have a superpower, what would it be? Telekinesis. Least favorite food? I have gagged on both prunes and sushi (though not at the same time). It’s a texture thing. Favorite meal? Good Italian pasta. Or soup with homemade bread. Biggest pet peeve? People not doing the job they’re supposed to. Spitting on the sidewalk grosses me out. Favorite junk food? This list is longer than it should be. Nickname as a kid? Jules. First author hero? C.S. Lewis. Last book you read? As Old as Time: A Twisted Tale by Liz Braswell. Last song you downloaded? Evermore (Dan Stevens version from BEAUTY AND THE BEAST). Favorite cookie? Soft Chocolate Chip. What TV show do you miss that’s been canceled? Star Trek: Enterprise (it was just hitting its stride when it was canceled). Last TV show you binge-watched? Grimm. Favorite TV show when you were a kid? The Wonderful World of Disney. Or Batman. What movie made you cry the most? Not fair. I cry easily. I’m really good at … solving puzzles. I’m really bad at … asserting myself. Anything you’d like to reveal? Leave a question or comment and Julie will give one lucky poster a copy of her RITA finalist book, APB: BABY (print or digital). 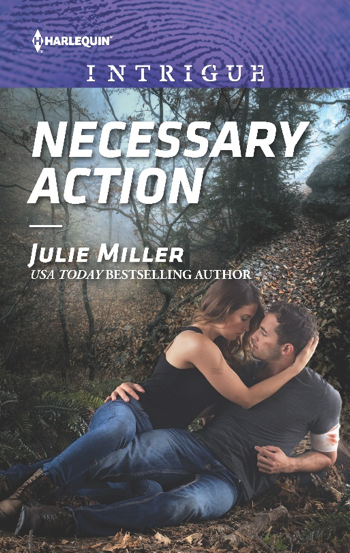 USA TODAY bestselling author Julie Miller has earned a National Readers Choice Award and a Career Achievement Award from RT BookReviews among many other prizes for both her series and single title books. She is thrilled to announce that this year she is a finalist for Romance Writers of America’s prestigious RITA Award. With millions of copies in print worldwide, many of her books have appeared on the USA Today, Publisher’s Weekly, Amazon and BookScan Top 100 Romances bestseller lists. Find out more at www.juliemiller.org. Giveaway ends 11:59pm EST April 8th. Please supply your email in the post. You may use spaces or full text for security. (ex. jsmith at gmail dot com) If you do not wish to supply your email, or have trouble posting, please email maureen@justromanticsuspense.com with a subject title of JRS GIVEAWAY to be entered in the current giveaway. Congratulations on the RITA nomination for APB: Baby. I am reading it right now, and it is terrific. I also loved the Maggie interview in your most recent newsletter. Thank you, Gayle! I'm pretty excited about the nomination. I'm so pleased you are enjoying the book! Interesting question, Trude. I'm what my friend Delores Fossen calls a "cooker". I don't outline my stories before I start, but I do spend a lot of time mentally getting to know my characters. I generally have an idea of a few plot points (the climactic battle or black moment, the first meet, etc. ), but how I get from point A to point B is strictly by the seat of my pants. However, because I know my characters so well (their background and personality, their goals and fears, etc. ), I rarely veer off course. I just stay true to how my characters would act. I do have friends who write pretty detailed outlines. But for me, once I plot out that much of the story, I feel like I've already told it, and it impacts my creativity. Thanks, Tammy! Good to "see" you here. Love your KC books and looking forward to reading this. Thanks so much, Mary. I'm actually heading to Kansas City this weekend for a family event, so I'm sure I'll come away with some new inspiration for another KC story. Julie Miller is always a pleasure to read. Congratulations on your nomination. I always enjoy your books and I can't wait to read this one. Another book to devour by Queen Julie! I've been an avid reader for years but you already knew that. Ha! I love it, "Queen Julie." Thanks so much!